We wanted to alert you about a special exhibit titled Tekahionwake: The Career & Celebrity of E. Pauline Johnson on now at the Chiefswood National Historic Site, near Brantford, Ontario. 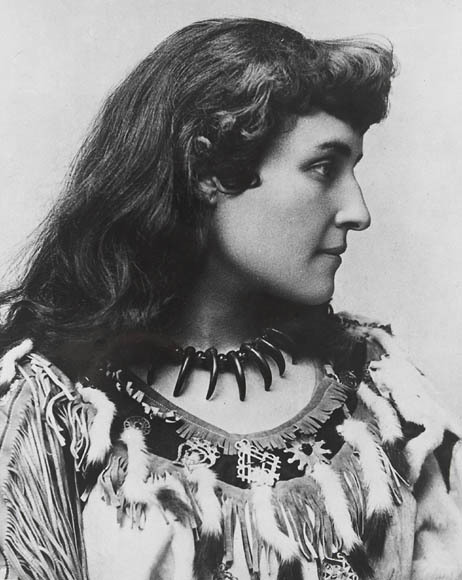 E. Pauline Johnson was a half-Mohawk, half-English performance artist who took the guise of Tekahionwake during her stage performances across Canada, England, and the U.S. from the 1890s – 1910s. Johnson’s naturalistic style of poetry and dramatic costumes effectively broke down stereotypes surrounding Native American women. Her persona is portrayed beautifully in the historical fiction, Gwen, by Carolyn Pogue. You can read more about E. Pauline Johnson, and Gwen, including excerpts from the novel, here. The exhibit will feature historic photographs, performance posters, contemporary artwork, artifacts associated with E. Pauline Johnson, as well as projects submitted by local schools commemorating the life and career of the artist. Get your ticket today through The Heart of Ontario to take advantage of their 2 for 1 admission offer! This entry was posted in Uncategorized and tagged Carolyn pogue, E. Pauline Johnson, Gwen. Bookmark the permalink.